Labour is closing the gap with Tories and now stands just three points from Theresa May’s party, a new YouGov poll shows. The poll, commissioned by The Times, found the Conservative lead has slipped dramatically in recent weeks and is now within the margin of error. The figures show the Conservatives on 42 points but Labour are nipping at their heels on 39. Meanwhile the Liberal Democrats are struggling to maintain the momentum of their "fightback" as their numbers slip to just seven. This is a remarkable change in fortunes for the Tories which had a 24-point lead over Labour when the snap general election was called in April. 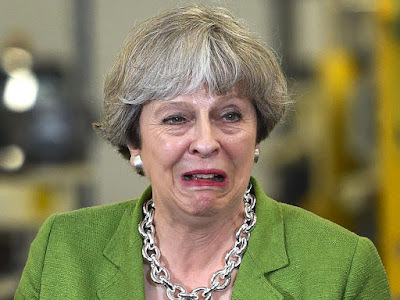 Ms May has struggled in recent weeks after she was forced into an embarrassing U-turn over plans to reform social care in the party's manifesto. The party said elderly people who needed care will be able to put off playing for it until after their deaths so they could potentially stay in their own home for as long as possible. But critics said this would unfairly penalise people who suffer a slow decline from illnesses like dementia over people who die suddenly and can then leave their estate to their children. Meanwhile many have criticised Ms May's reluctance to engage with voters especially after she declined to take part in the televised debates – sending Home Secretary Amber Rudd in her place. During the debate Green party leader Caroline Lucas said: “You don’t call a general election and say it is the most important election in her lifetime and then not even be bothered to debate the issues at hand." She added: “I think the first rule of leadership is to show up." This poor performance has not gone unnoticed with the voters as Ms May's personal appeal over Jeremy Corbyn is slipping. It comes as Ms May is planning a speech to refocus the campaign on Brexit on Thursday where she will say it is a "great national mission" which she is best placed to lead. She will promise to use the "promise of Brexit" to transform the country for the better. Ms May has used Brexit as a device to attack Mr Corbyn, saying he would find himself "alone and naked" in the negotiations with the rest of the EU.